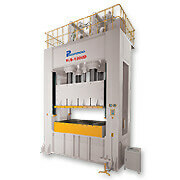 At Hsin Lien Sheng we are able to fully customize hydraulic deep drawing presses. Whether you need an extra heavy-duty pressing capacity, special sized table area, or customizable pressing speed, we can cater to all wishes. All of our presses are built with meticulous attention to detail so that our customers can be guaranteed the absolute highest quality machines. All of our hydraulic deep drawing presses have a very accurate control system and a great working efficiency. Safety is also a key area that we take very seriously so all of these machines have a number of built-in safety features to ensure maximum safety at all times. 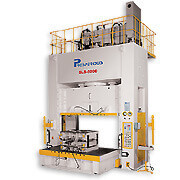 Do not hesitate to contact us to learn more about all of our customizable hydraulic deep drawing presses and how we can construct the ideal machine for you at a very competitive price. The hydraulic deep drawing press is a specially designed machine in high accuracy and excellent performance, for deep drawing and forming metal plates. 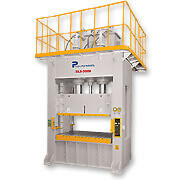 The capacity range from 10 Tons to 3000 Tons is available as customers’ demands. Hsin Lien Sheng is one of the most reputable manufacturers in the industry for making high quality hydraulic press and for providing prompt services. Since established, Hsin Lien Sheng endeavors to make innovative hydraulic press that can help customers increase productivity while reducing the maintenance cost. We own the skills and experiences to provide custom service in order to satisfy customers' special needs for hydraulic press. Therefore, if you are interested in our hydraulic deep drawing press series or our service, please contact us, and we'll serve you immediately. Our policies are excellent quality, diligent service and an outstanding brand. Based on the principle of business continuity and prosperity, we always strive and pursue the continuous improvement to reach perfection, with the expectation to enjoy the bright perspective with all elites of the industry. Add: No. 33, Rd. 36, Industrial Area, Taichung, Taiwan, R.O.C.